Shirty is a Producer, DJ, Musician, Maker and Educator. In 2018 he released his first album of electronic music. 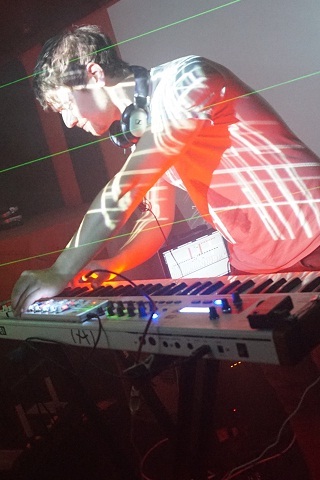 He is exploring new ways of performing with a homemade laser drum kit that visually turns movement into sound. Shirty has also developed a laser-based video game which debuted at The Franklin Institute, Philadelphia on June 26th 2018. Musical influences include Yotto, Kidnap, New Order, Pink Floyd, Deadmau5, Nils Frahm, Moby, Gabriel & Dresden and Eric Prydz. "Some nights in clubs I'd throw my hands up in the air perfectly in time to something big happening in a track, and I'd feel like I'd made the music happen. That's where I got the idea to design a laser drum kit, so that I can move in this natural way and actually make music from my movements. I used lasers because they look good in dark nightclubs. Building this was also about performing electronic music in an engaging way. It allows me to make new music by improvising during a gig. I can loop and layer the sounds on the laser beams to construct entire tracks in front of an audience. I built the laser drum kit in my front room, mostly using parts from main street stores and eBay. I used a cool new self-curing rubber called Sugru to hold the lasers in place at the correct angles. I want my laser drum kit to inspire people that music making can be easy, because I've found it such a good thing in life."